Iowa’s unemployment rate in January dropped to 4.2 percent, down from 4.3 percent in December and 4.4 percent one year ago. 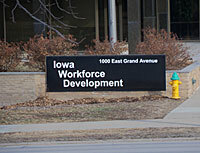 Iowa Workforce Development (IWD) spokesperson Kerry Koonce says January marked the fourth consecutive month the state added jobs. “We added 3,100 jobs in January, so we’re over 1,562,000 jobs for the state,” Koonce says. The U.S. unemployment rate was 5.7 percent in January. Koonce says several industries in Iowa are at or near all-time highs in employment. “We are up, over this time last year, almost 25,000 jobs…we’ve seen gains in sectors across the state, so that speaks very good for Iowa’s diversified economy,” Koonce says. The trade and transportation sector added 2,200 jobs in January, according to the IWD report. Professional and business services added 1,800 jobs. Around 900 construction jobs were eliminated across the state in January, but Koonce says that industry is still booming in Iowa. “If you look at January of 2015 compared to January 2014, we’re up 6,500 jobs in construction,” Koonce says. Iowa’s construction sector is coming off an all-time high of 77,500 jobs reached in December.